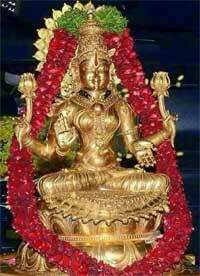 Goddess Kirti is a manifestation of Goddess Lakshmi. She is actually the manifestation of Narayani as per Lakshmi Tantra. She is thus the consort of Vishnu or Narayana. Legend has it that Goddess Narayani divided herself into four – Lakshmi, Kirti, Jaya and Maya. Goddess Kirti bestows fame on her devotees. Goddess Kirti resembles Goddess Lakshmi in her garb and ornaments, except that sometimes her complexion is fair like the kunda flower or campaka flower. Kunda flower is a variety of white jasmine. Champaka flower color is golden yellow. Om hrim krim traim namah sadoditanandavigrahayai hrim krim svaha. kram tam krim tam krum tam krim tam kraim tam kraum tam.